If I can't have Bobby Flay as a boyfriend, at least I could have him in my kitchen! Ok, that's not entirely true. What I do have in my kitchen is Bobby Flay's cookware: a set of 3 non-skid bowls and a square cast-iron griddle pan courtesy of Kohl's! I love that the bowls are made from thick stainless steel and have a non-skid bottom. This makes mixing salads, whipping cream, or making a dressing easy. Of course I love that the non-skid bottoms are red! The bowls nestle in one another making storage a breeze, and are shiny and pretty. Yes, that's important to me. 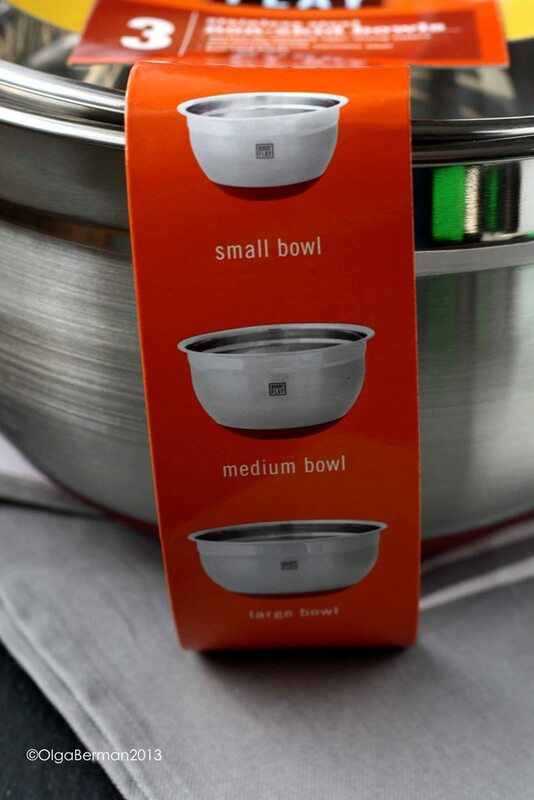 I just wish these bowls came with lids. I was nervous about the grill pan because it got some not so stellar reviews on line, but I was willing to give it a try. It's pretty heavy, so you definitely need to be careful while using it. Luckily, the pan comes with a helper handle. To my delight, food did not stick to it because not only does the pan come preseasoned, but it also has nonstick interior. I think the key is to allow the food to cook long enough for it to release itself from the grill instead of moving it back and forth. BE PATIENT. Even though I have a panini maker, sometimes I might not want to cook my food simultaneously on both sides. 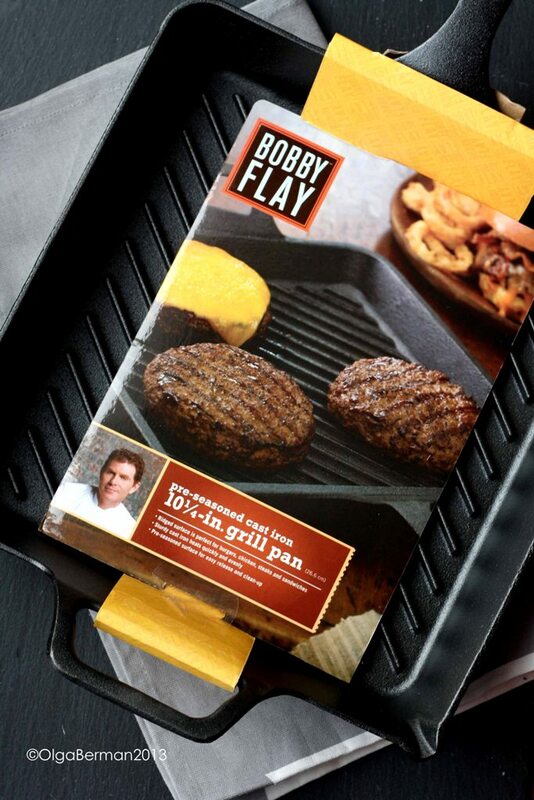 This grill pan is perfect for super thick steaks, and it can go from the stove directly into the oven: a panini maker can't do that. The clean up is similar to cleaning a cast-iron skillet, so if you have one, you know what you are dealing with. Curious to see what I made using these two new kitchen toys?! Well, it had to be one of Bobby's recipes of course. 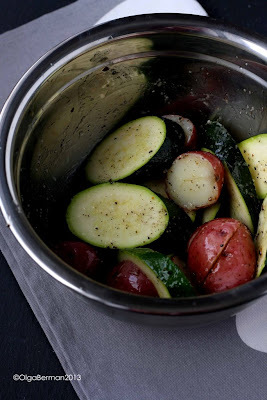 However, instead of cooking a burger, a large pork chop or a juicy piece of steak, I decided to go with Grilled New Potatoes and Zucchini with Radicchio, Goat Cheese and Aged Sherry Vinaigrette. 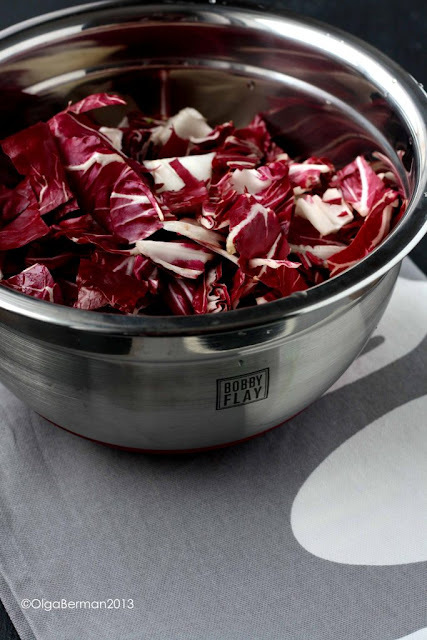 Who knew I would like radicchio so much!? Not only is is really pretty, but it has a slightly bitter taste and a great crunch. See how pretty it looks in the bowl? 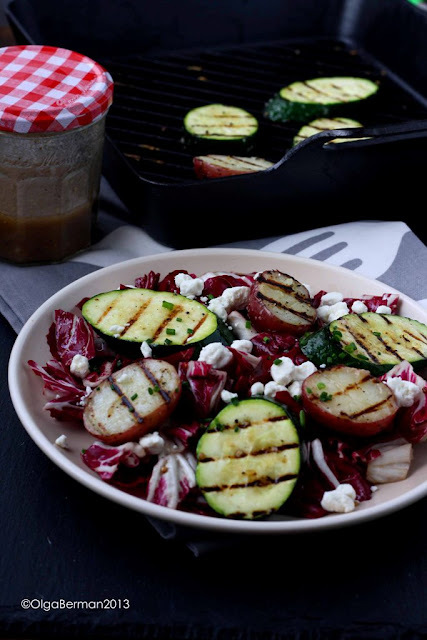 While you keep the radicchio as is, you grill the parboiled potatoes and sliced zucchini as soon as you drizzle them with olive oil and season with salt and pepper. 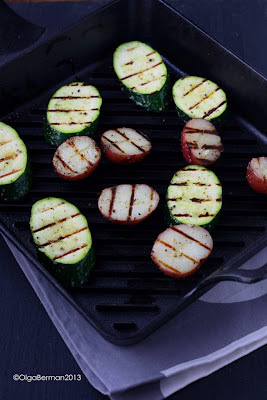 Check out those grill marks!! The vinaigrette in this recipe is superb: mustard, sherry vinegar (first time I use this type of a vinegar), shallots, olive oil and salt & pepper. Once the vegetables are grilled, you mix them with some of the vinaigrette and pile them up on top of radicchio. All that's left to do is to add crumbled goat cheese and chopped chives. I LOVED this salad and even shared it with my friend Cindy. 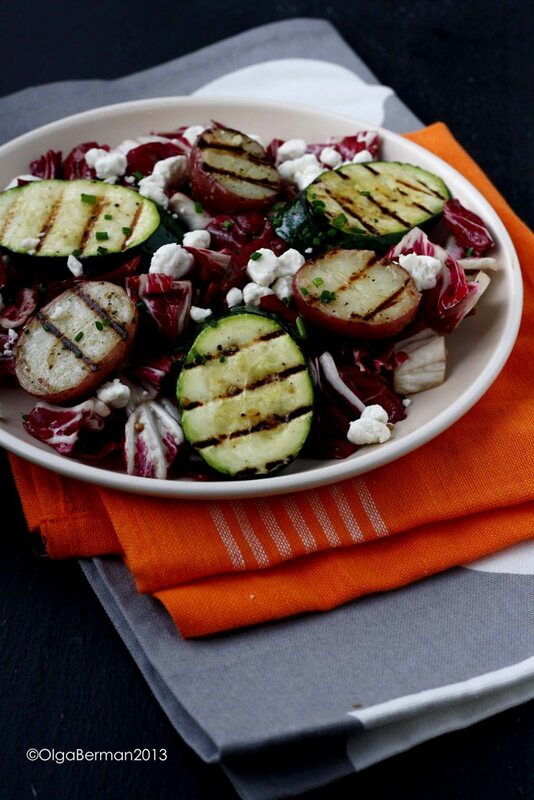 The grilled vegetables soak up the vinaigrette immediately and are a wonderful contrast to the cold crunchy radicchio and cold but creamy goat cheese. 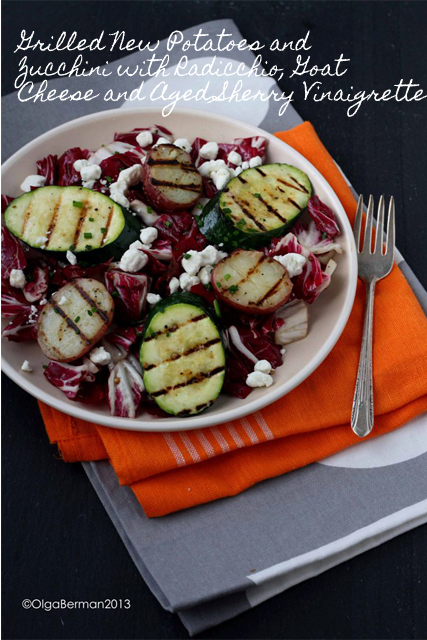 Who said vegetarian recipes are boring? 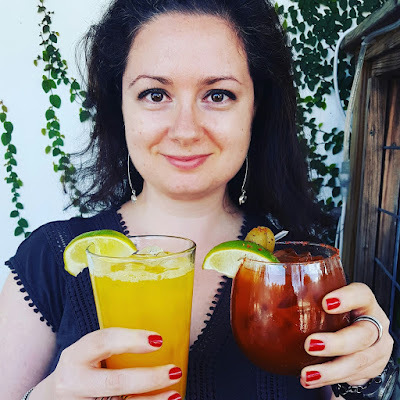 Would I recommend my new kitchen toys to you!? Absolutely! 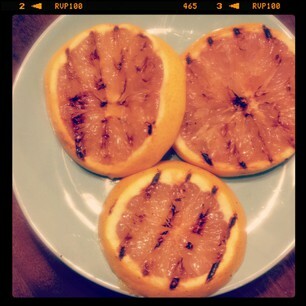 In fact, just before sitting down to write this post, I grilled grapefruit slices: so good! 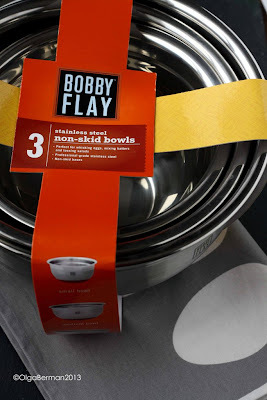 Disclosure: Kohl's provided me with the bowl set and the grill pan for a review. 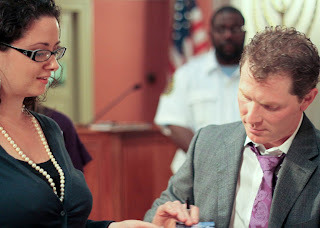 I was not compensated in any way for writing this post. All opinions are my own.